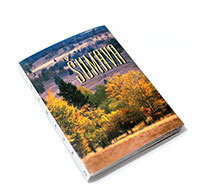 We are a publishing house specialized in promotional, tourist and souvenir printed products with a corresponding range of items in our product list. Each of the items in the list includes a link which, when clicked, opens a detailed pricing list below, and a link which shows a gallery in the right column of this page. Go through the characteristics and features of the product you are interested in and see the pricing. Contact us at our address or phone number and we will be happy to answer any of your questions and give details of the product you have chosen. After we are familiar with your requirements and we agree upon the date and means of delivery of your product, you will send us an order form with your address, the type of the product, the number of copies, price per copy and the estimated date of delivery. 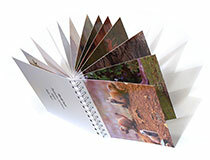 After we have received your order, we start acquiring the printing fundamentals - i.e. you will either send us your photographs to be used in the product or we will arrange a term when we could come and take photographs ourselves (depending on the season). 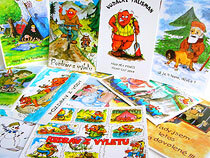 In case of cartoon postcards we will instruct our illustrator. We can either use the text you send us or we will suggest our own texts which we consult with you before printing. If needed, we will take care of their translation into foreign languages. We will make a computer sketch of the graphic design of your product and will send you a preview for authorization. 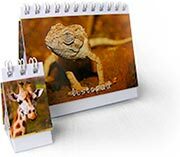 We will print and, if needed, complete your product (calendars, miniature books and picture gatefolds need to be completed after printing). 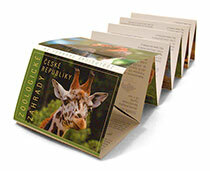 We will deliver your product either in person or send it via mail service before or on the date given in the order form. After the product has been delivered, we will send you an invoice. 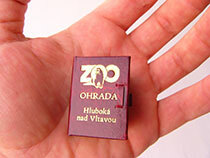 Miniature books, colibris, are of appx. 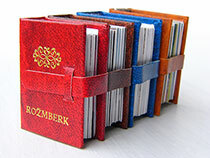 2.5 × 3.5 cm (1" × 1.4") size, which are usually used as original souvenirs. 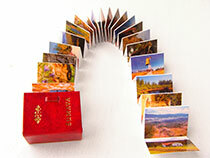 Inside a colibri there's a miniature picture gatefold with 24 or 48 pictures. 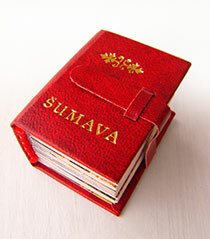 The cover has a golden imprint of an ornament (heraldry or a logotype) with the name of the book underneath. Colibri covers are made of baladek in various colours and the front can be fastened with a strap. Colibris can be attached to a leather lace. As the assortment of colibris widens, these miniature books are becoming a sought-for collectors' items. The minimum number of copies when ordering a new type of a colibri is 600 copies. 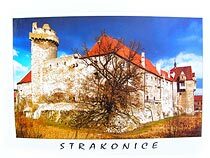 In case of orders of an older type of colibri which we previously self-published (The Sumava, The castles and chateaus of the Czech Republic / Southern Bohemia / Central Bohemia) we can deliver any number of copies. 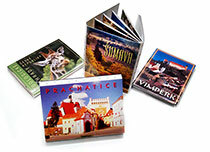 The above prices are valid for paper weight of 250 g/m2 and glossy lamination on the obverse. The prices also include photographer's work, any usual graphics design work, text description of the photos and their translation into English and German. 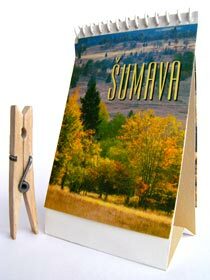 Apart from standard calendars of larger formats or calendars made of postcards we also specialize in miniature calendars, sized merely 2.8 × 4.5 cm (1.1" × 1.8")! 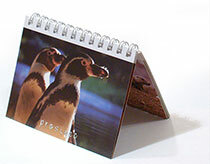 These calendars have no calendarium and only contain the pictures and month names, so they can be used for a number of years. As the calendars are variable regarding their design, type and format, price calculation has to be made for each given calendar separately, based on the specific requirements of the customer. 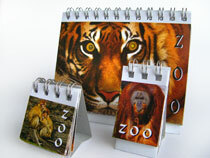 As an example, we present prices of two types of calendars - small and miniature ones. 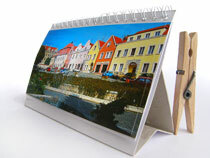 1) Small calendar with 13 pages, sized 10.5 × 8 cm (4.1" × 3.14"). As this calendar is rather small and mostly decorative, it has no calendarium and its pictures can be used for several years. 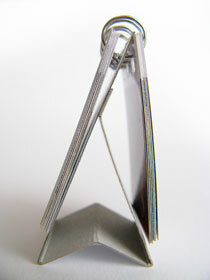 The pages only contain month names and are joined with a wire spiral. 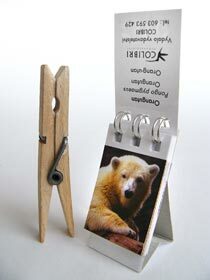 The calendar is supported by a white paperboard stand. 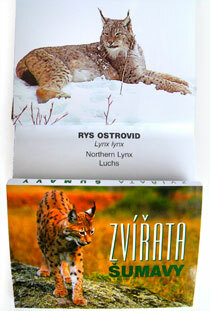 2) Miniature calendar with 13 pages, sized 2.8 × 4.5 cm (1.1" × 1.8"). Neither this calendar has a calendarium and thus can be used for several years. 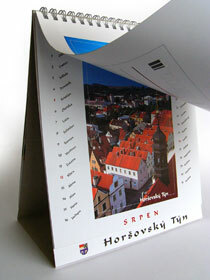 The pages are joined with a wire spiral and the calendar is supported by a white paperboard stand. 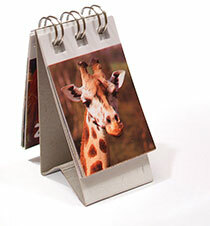 The above prices are valid for paper weight of 200 g/m2 of the calendar pages. The prices also include photographer's work, any usual graphics design work, and final completion into the calendar shape. 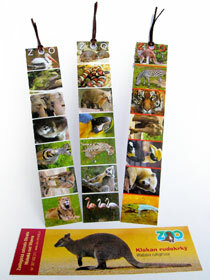 Picture bookmarks are a new item in our product list. 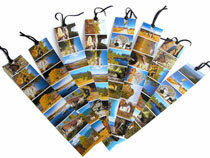 They are shaped as a narrow stripe with 7 photos (animals, sceneries, towns, castles) with their description on the reverse. At the top of the bookmark there is a punched hole with a leather strap. 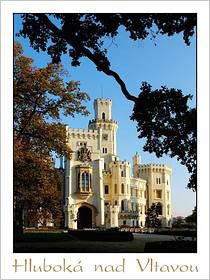 With 500, 1000, 1500 copies the price is 8,– CZK per copy (incl. VAT). 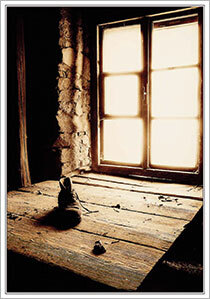 With 2000 and copies the price gets down to 6,– CZK per copy (incl. VAT). The price is valid for paper weight of 250 g/m2 and glossy lamination on the obverse. The prices also include photographer's work, any usual graphics design work, text description of the photos and their translation into English and German. 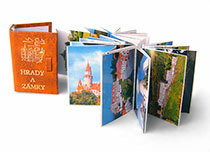 Classical picture gatefolds include thirteen photographs sized 7.5 × 10.5 cm (3" × 4.1") with brief descriptions in Czech, English and German. 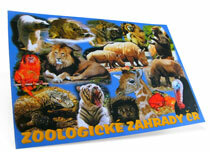 An item of special interest is a gatefold named "Zoological Gardens of the Czech Republic", which incorporates all zoo gardens of the country on 15 pictures with features and characteristics of each of them on the reverse side. The price is valid for paper weight of 250 g/m2 and glossy lamination on the obverse. The prices also include photographer's work, any usual graphics design work, reverse side special effects (watermark background) and text description of the photos and their translation into English and German. We specialize in boating and tourist cartoon postcards. 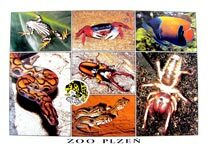 Apart from postcards with standard format we have also published an extremely popular postcard which, image-wise, joins all Czech zoo gardens. 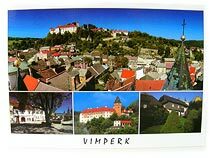 Besides that we also publish standard postcards of cities, towns and townships all around the Czech Republic, postcards of the Sumava mountain range, zoological gardens, comprehensive collections of postcards of neigbouring townships etc. 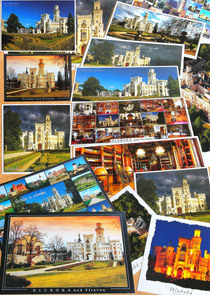 The price of a photo postcard in a standard size (10.5 × 15 cm, i.e. 4.1" × 5.9") is 3,– CZK per copy (incl. VAT). 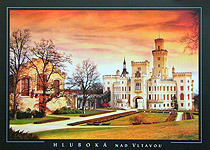 Double sized postcard (i.e. 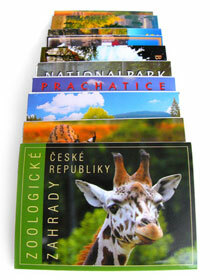 15 × 21 cm - 5.9" × 8.3") costs 6,– CZK per copy (incl. VAT). The price is valid for 3000 copies, paper weight of 300 g/m2 and glossy lamination on the obverse. The prices also include photographer's or illustrator's work, any usual graphics design work and reverse side special effects (watermark background, schematic map). 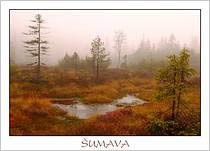 In case of more than 3000 copies (usually multiples of this number, e.g. 6000 or 9000) the price of a copy gets lower. Please contact us for further information. 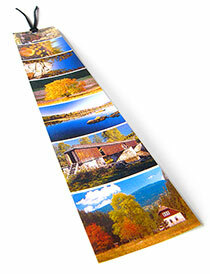 A number of boating and tourist postcards are printed and ready to be delivered in any number of copies. 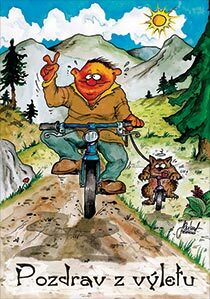 If you wish to order a custom cartoon postcard, we will follow your vision and will consult the design of the postcard while it is in the making. 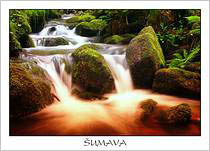 All expenses regarding the postcard design are included in the price. The author of the cartoons is Slavek Petruzela. Photomagnets, sized min. 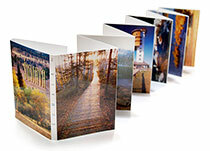 8,5 × 6,5 cm have a colour or b/w photo printed on the front side. The photo is graphically framed and accompanied by a caption indicating the given place. 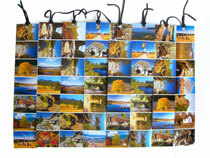 The back side of the photomagnet is made of magnetic foil. 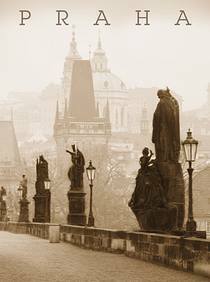 The author of the photographs is Petr Šebek. 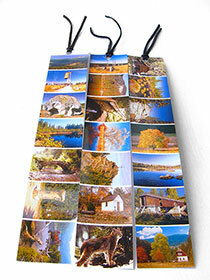 We can also make photomagnets from your custom photos. In the product list on the left you can click links "Picture gallery >>". Upon clicking, you photographs of the desired product will appear in this column.